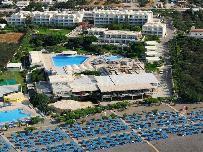 The Club Kalimera Sunshine Kreta is located in the village of Koutsounari, on the idyllic island of Crete. The property enjoys a prime beachfront location, and provides easy access to a long stretch of golden sands and the warm, blue waters of the Aegean Sea. Guests will also find a great selection of water sports on offer around the area.Alternatively, if youre interested in discovering a little local culture during your holiday, the fascinating old town of Ierapetra is only 5 miles away. With its excellent provision of children's entertainment, as well as a playground and high chairs in the restaurant, the Club Kalimera Sunshine Kreta is ideally suited to family groups. However, business guests will also be able to take advantage of some great conference facilities, making this a good venue for business meetings.